Adele, Beyonce and … John Oliver? North Korea launched a ballistic missile on Sunday in what some officials said was an attempt to challenge Donald Trump’s policy towards the nation. Iran demonstrated its might on Friday in a dramatic parade to celebrate the anniversary of the country’s revolution and diplomatic break from the United States. Last night’s 59th Grammy Awards exhibited its usual glitz and glam as the nation’s most recognizable pop stars joined together to celebrate all the music that dominated radio waves in 2016. Plus Sturgill Simpson. And while I’m increasingly convinced that Grammy officials choose nominees by getting drunk and googling “Top Musicians 2016,” I will admit that the show did provide a nice distraction from the usual doom and gloom news surrounding our current administration and the world’s response to it (see: first paragraph). Because the Grammys are so largely watched and even serve as many people’s refresher course to today’s music scene, it does fortunately provide some deserving artists with the necessary platform into national, if not global consciousness. Artists like Chance the Rapper. I’m admittedly ignorant towards hip-hop because it simply just doesn’t appeal to me, but Chance the Rapper won me over during his ESPYs tribute to Muhammad Ali last summer. I learned that, despite his stage name, Chance the Rapper is as much a singer as he is a rapper. But most of all, he is a lyricist. Chance won two major Grammy Awards and showcased his abilities in an energetic, soulful show-capping performance. The average music listener knew who he was, but now everyone witnessed his talent. Other than that, we watched Adele boldly stop her live tribute to George Michael to start over after a dysfunctional start. We saw the members of Twenty One Pilots remove their pants before walking on stage to accept an award, and then share an endearing story about how they pledged years ago while watching the Grammys to go pants-less if they ever ended up winning anything. We saw CBS severely overestimate the universality of the lyrics of “Sweet Caroline” in a Carpool Karaoke sketch that fell flat. And we saw Beyonce do … something. While I like to think of myself as verbally creative and imaginative, I’m severely lacking an artistic gene, and thus any symbolism behind Beyonce’s performance completely went over my head. But it was visually stimulating, and she sounded great. So, in conclusion, Beyonce’s the queen, we’re all inferior, she probably should’ve won Album of the Year over Adele, and I’ll leave it at that. At this point, I think it’s safe to assume that Adele and Taylor Swift will spend the next 20 years alternating who wins the most Grammy Awards annually. Next year, it’s all T-Swizzle. But the evening couldn’t be completely devoid of politics. Around the same time the Grammys neared its end, HBO saw the welcome return of John Oliver and his brilliant show Last Week Tonight. His segment, focusing on Donald Trump’s clear disconnect from reality, is a must-watch for any American. It’s been extremely evident to see how much Trump lies, but John Oliver has a way of condensing a topic to make it so bright-as-day that you can’t possibly deny it. It’s the 30-minute release that Trump opponents have been waiting for, and it’s objectively insightful. I guess that means if Beyonce is the queen for music lovers, than John Oliver is the king for us political nerds? My life clearly needs more excitement. Perhaps I’ll go to work tomorrow pantsless, Twenty One Pilots style. That’s it. I’ve decided. I’m doing it. And by pantsless, I mean wearing corduroy pants and an argyle sweater. For the sake of future children everywhere, I hope that that the person who writes the authoritative textbook on history for students decides to go from 2015 straight to 2017. Between the iconic celebrity deaths, the Chicago Cubs defying order and reason by winning the World Series, and of course, the rambunctious presidential election that resulted in one of the most unpopular president-elects in our nation’s history, it’s safe to say that most people won’t be too upset to turn the calendar over in a few weeks. But first, as in all years, December is all about reflection. It’s the time when we review the events of the last 12 months with year-end lists, award nominations, and of course, Time’s selection of Person of the Year. Before I spoil the major surprise by revealing who that person was, let’s first talk about Tuesday’s nomination announcements for the Teen Choice Awards — I mean, Grammys. I don’t know If I am becoming more out of touch with today’s popular music, but I have never been more dumbfounded by Grammy nominations than this year. Four of the five best album nominations belong to Beyonce, Adele, Justin Bieber and Drake. How in the world is this an accurate reflection of the best music that our nation has to offer? Those are the best albums of the year? If the Grammys wants to cater to a younger audience and pay homage to the music that makes the biggest dent on the radio and in album sales, then fine, there’s nothing wrong with that. But we need to recalibrate what exactly the Grammys is. It’s not the best music. It’s the most talked about music. The fifth person in that category, by the way, must have surprised the majority of people who were expecting it to be rounded out by some one like Frank Ocean or Kanye West. It’s Sturgill Simpson, a folk/alt-rock musician whose 2016 album, A Sailor’s Guide to Earth, is actually pretty damn good. I’d recommend listening to the track “Welcome to Earth (Polywog),” which should give you a decent idea of what the man is all about. I laugh when I think about all the teenagers who must have tweeted their confusion over who Sturgill Simpson is on Tuesday morning. Although, in their defense, he was just as surprised as everyone else. And Time Person of the Year. Obviously it was Donald Trump. There’s no denying that no man played a bigger impact in global conversation this year than him — even if readers preferred Indian Prime Minister Narendra Modi. Hey, Hitler and Stalin (twice!) were also Time Persons of the Year. Just sayin’. This selection is so obvious that it’s not even really news. If you have to make a Trump Meter of the top news stories involving Donald Trump, it wouldn’t even crack the top 10, following his potential policy-shifting phone call with Taiwan, his spontaneous lambasting of Boeing and his selection of a climate-change dissenter and a WWF founder to his cabinet. And that’s all in the last six days. If Trump is the Person of the Year in 2017, 2018 and 2019, too, well then future historians might as well just leave out this entire half-decade when they write the next textbook. Obama left office in 2017 … and then it was 2021. For a show that exists to honor the best in music for the past year, the 58th Annual Grammy Awards did not seem all too interested in giving out, well, awards. Of the 81 awards disseminated by the academy on Monday, only eight happened live on television. The rest of the three and a half hour broadcast was filled with performances. Which isn’t necessarily a bad thing. Acceptance speeches are widely considered the most boring part of an awards show. But there are just so many artists and bands who won Grammys, who, for all intents and purposes, may as well have not existed on Monday because their category didn’t make the live show. Consequently, anyone who doesn’t stay up to date with music but only tunes into the Grammys officially thinks the only musicians that exist right now are Taylor Swift, Kendrick Lamar, Meghan Trainor and the Weeknd. Anyway, like any awards show, there was the good and the bad last night. The talk of the town are the first two people I mentioned above. Taylor Swift, who became the first women to win Album of the Year twice, and used her speech to not only empower young woman, but to apparently throw some serious shade at Kanye West. Taylor, I’m on your side. But when you publicly shame Kanye, it does not go quietly. The man may be a musical genius, but mentally, he’s not all there. Keep Selena Gomez and the rest of your female posse close by. You may need it. The other highlight was Kendrick Lamar, whose 2015 release “To Pimp a Butterfly” swept all the rap categories but fell short on Album of the Year to Swift’s “1989.” But what people will remember most was his spellbinding, socially conscious performance, which will probably upset the same white people who didn’t like Beyonce’s Super Bowl halftime performance last week — which, might I add, Saturday Night Live hilariously chimed in on this weekend. What people also will likely remember was Lady Gaga’s tribute to David Bowie, which frenetically rushed through 10 of his songs in a matter of minutes. While ambitious, the whole thing seemed too chaotic and over the top, which, apparently was the same sentiment expressed by David Bowie’s son. And what gives with Justin Bieber’s performance? It was his first time getting to perform nationally in the Post Everybody Hates Bieber era (which, correct me if I’m wrong, is somewhere between the Jurassic and Pleistocene era on the epochal timeline), and they took his song that is grounded in electronic, computer-made sound and instead performed it with actual instruments? It changed the entire complexion of the song. Oh, and don’t even get me started on the mess that was the Hollywood Vampires. That was just scary. But let me say this. The Grammys seem to be obsessed with medleys, unusual artists pairings, and experimental performances. It’s the Grammys, so they want everything to be unique. And that’s what made the performance by the Eagles, joined by Jackson Browne, singing “Take it Easy” as a tribute to the late Glenn Frey so special. They simply sang a classic song, from start to finish, telling people to take it easy in an era when people are no longer physically capable of taking it easy. It was the most honest, sincere and heartfelt moment of the night, in my mind. On that note, I can’t think of any better way to pay tribute to their tribute by spending the rest of the evening taking it easy by pulling my own Eagle. That did not come out right at all. The main reason I wanted to wait a day to talk about Donald Trump’s senseless proclamation he made towards Muslims on Monday was to give the world time to digest it. I was hopeful that decency and sanity would prevail. The world has not lost its mind. At least not yet. Not only did fellow Republicans condemn his proposal — including new Speaker of the House Paul Ryan, who previously had said he would not comment on the presidential race — but people across the world came out to voice their disapproval. The mayor of St. Petersburg in Florida facetiously said he was “barring Donald Trump” from entering his city until all Trumps are proven to not be dangerous. As someone who spent much of his childhood — and admittedly, some of his young adulthood — immersed in the Harry Potter universe, this was especially awesome for me. But that’s that. It’s not even worth dignifying such bigotry with any more commentary. Especially when yesterday brought us other news. The Daily Show welcomed back a familiar face, as Jon Stewart returned as a guest to publicly shame the Republican lawmakers who are holding up the renewal of the Zadroga Act, which provides treatment for those who were among the first responders on Sept. 11, 2001, a large chunk of whom are dying now from the toxic fumes they inhaled that day. It was a really powerful piece and one definitely worth watching. And it was a stark reminder of how much our world needs Jon Stewart. Especially now. For years, he was the voice of reason who entertained and comforted us every night at 11 p.m. And boy, we could really use some common sense right now. It was Stewart who championed the passage of the bill five years ago when he had four 9-11 responders on his show. On Monday night, only one of those four were able to return. The other two were too ill, and the third one is dead. It’s not easy to be a half-humorist half-political commentator who actually makes a difference in the world. With this blog, I make a difference in the one person’s life who accidentally stumbles across this site via a Google search. And you know what? I’ll take it. Last, nominations were revealed on Monday for the 57th Grammy Awards, which will take place Feb. 8. There were no major surprises; Taylor Swift’s 1989 is up for Album of the Year, which will naturally anger some people. And for those wondering, Adele was not eligible, hence her absence from the nominees list. But she’ll probably kill it in 2017. But I must express my extreme displeasure with one egregious snub: Sufjan Stevens. His album, Carrie and Lowell, is without a doubt among the best of the year. And he got nothing. Not many people are capable of delivering lyrics in such a haunting, soul-tickling manner like he can. It’s a shame he wasn’t recognized on a national level, and it also deprives the general public from learning about a very talented artist. Oh well. Sufjan, I see you. And you may never win music’s biggest prize, but, if it’s any consolation, allow me to bestow you with a WeinGrammy®. For reference, it’s somewhere between a Video Music Award and a Kid’s Choice Award, and about equivalent in self-validation to a Tinder match. For a moment, visions of the 2009 MTV Video Music Awards flashed before everyone’s eyes. Kanye West, who, six years ago, infamously stole the spotlight from Taylor Swift to show his support for Beyonce, was about do it again. After alternative rocker Beck was announced as the winner of Album of the Year at last night’s 57th Grammys, Kanye returned to the stage, only to jokingly wave his hands, laugh, and return to his seat. The audience got a kick out of it, and even Beck took it in stride. It was all in good fun. Kanye, who’s public image took a drastic hit after that initial incident — including being called a “jackass” by our president — had clearly learned from his mistake, and in a very self-aware moment, poked some fun at his old self. Even Beyonce and Jay Z found it amusing. Had Kanye simply never opened his mouth again for the remainder of the night, people would still be laughing along with him. Instead, they’re none too pleased. Fans of Beck have come out in full force to his defense. In a career that has spanned more than two decades, Beck has released 12 albums. He wrote, composed and produced his latest album, Morning Phase, and as one Twitter user pointed out, he played the guitar, keys, synthesizer, bass, tambourine, ukulele, charango, celeste, dulcimer, harmonica and the glockenspiel on it. Kanye West can’t even spell half of those instruments. Beck, meanwhile, has handled the situation flawlessly. It’s just another incident on a long list of questionable decisions by Kanye West. There is absolutely no doubt of his artistry and talent. That’s undeniable, and any one who tries to discredit it is just wrong. I mean, there’s a reason that Paul McCartney wanted to work with him. He’s also won 21 Grammy awards. But he continually butts his head into things that do not concern him. Beck won arguably the biggest award of his life last night, and Kanye had to grab some attention away. If he is so upset about how awards shows determine their winners, then he should start his own event. The Kanyes. Every award goes to Beyonce. I think people are just sick of his shtick, and are especially upset that he tried to make his point by attacking Beck, who is as much of an artist as any one in the music industry today. An unintended consequence of Kanye’s antics is that he has become a public relations wizard. By making himself look so bad, he makes his “victims” look like sympathetic heroes in comparison. Taylor Swift’s career catapulted to monumental levels of success following her rendezvous with Mr. West, and because of last night, Beck has never been more widely discussed on a mainstream level than he is right now. 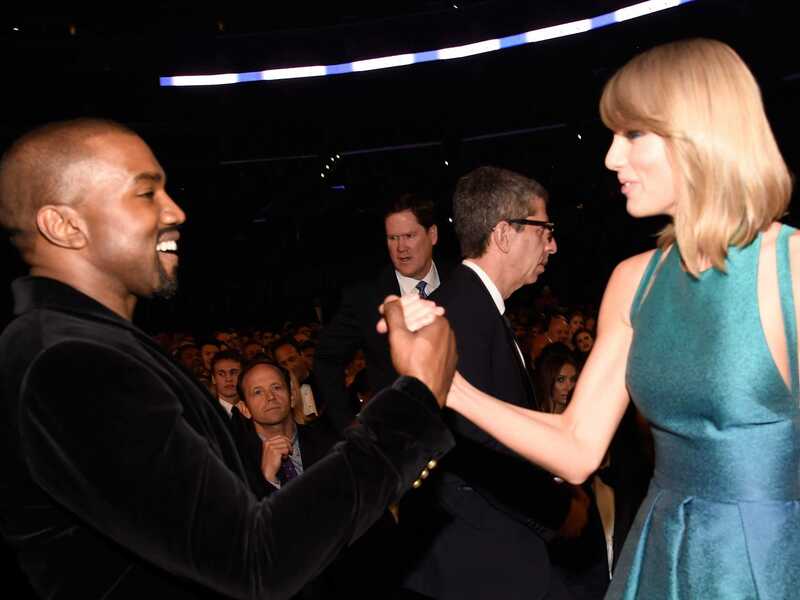 Oh and for the record, Taylor and Kanye have since made up. On a personal note, some may recall I pegged Morning Phase as the best album of 2014. What’s ironic is that, for the last six years, I have posted here my top films of the year, and to date, none of my six selections for the year end best movie has ended up winning Best Picture at the Academy Awards. And yet, in my first year picking the year’s best albums, my top selection wins Album of the Year. Go figure. And yes, I am humble bragging. The rest of the Grammys was without drama, with Sam Smith taking home four awards, including Record of the Year. He genuinely seems like a polite, cordial young man who is passionate about music, so I have no problem seeing him rewarded. Especially after the controversy he received from the Tom Petty copying fallout. One pleasant surprise was seeing Kristen Wiig doing some interpretive dance with 12-year-old Maddie Zeidler during Sia’s performance of “Chandelier.” Wiig really is a multi-talented performer who doesn’t get enough love. What nobody did see in last night’s telecast was Eminem win Best Rap Album for the Marshall Mathers LP, his 15th career Grammy, since it’s a category that’s apparently not deemed significant enough to be distributed live. I get that the Grammys are trying to become a bit more family-friendly, but isn’t that category a pretty big one? Also, for the sixth straight year, I failed win the Grammy for Best Blogging. I’m still petitioning the academy to instill that one.